The new medical education facility to be built in Athens. 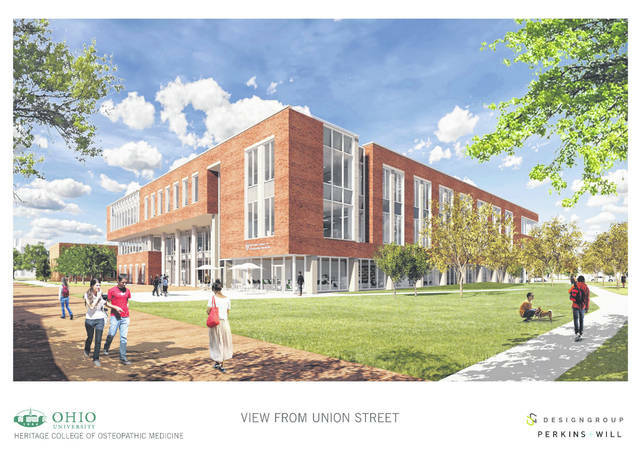 ATHENS, Ohio — Ohio University Heritage College of Osteopathic Medicine moved ahead on its plan to create a new medical education facility in Athens, when the Ohio University Board of Trustees approved release of the balance of funding for the $65 million project during its meeting Jan. 18. The board had previously approved about $9 million toward the project; the Board’s action released the remaining $56 million. The main part of the project involves construction of a three-story, 120,000-square-foot building, with a fourth-floor mechanical area, on a new Union Street Green across from the West Union Street Office Center (formerly known as the HDL Center). A nearby facility now housing OHIO’s Human Resources & Training Center also will be renovated for a number of Heritage College support offices. Construction is expected to begin in May and be completed in late 2020. Funding for the project comes from multiple sources including $5 million from the Heritage College, $6 million from the Osteopathic Heritage Foundation and $54 million from Ohio University’s “internal bank” (essentially a loan). The Heritage College is in discussions about reducing its need to borrow from the internal bank by using departmental reserves. Ken Johnson, D.O., Heritage College executive dean and Ohio University chief medical affairs officer, called the planned new facility an integral part of the ongoing evolution of the college and its approach to medical education. Building on the focus of personal wellness, the university aims to obtain both WELL and LEED certifications for the new facility. LEED (Leadership in Energy and Environmental Design) is an internationally recognized green building certification system, aimed at improving energy savings, water efficiency, carbon dioxide emissions, indoor environmental quality and stewardship of resources. LEED silver certification is a university standard for new construction. The WELL Building Standard is offered by the International WELL Building Institute, a public benefit corporation whose mission is to improve human health and well-being in buildings and communities. The WELL Standard looks at features of a building that impact human health and well-being such as air, water, nourishment, light, fitness, comfort and mind. If the new building obtains the WELL certification planners are hoping for, it will be one of the first medical education facilities in the country to do so. The Heritage College project is part of Ohio University’s 2016 comprehensive master plan, which called for creation of a new green along the West Union Street Corridor with the medical school as its anchor. In August 2016, the Ohio University Board of Trustees approved the university’s six-year capital improvement plan for FY 2017 – FY 2022, which included the Heritage College project. Partnering with the Heritage College on the new facilities are the DesignGroup , an architectural firm with offices in Columbus and Pittsburgh; Perkins+Will, an architectural firm headquartered in Chicago; Donley’s, a Cleveland-based construction company; and OHIO’s University Planning office. For more information and updates on the project, or to see a video about the new medical education facility, visit the college’s new facilities webpage. Information from the Ohio University Heritage College of Osteopathic Medicine. https://www.mydailysentinel.com/wp-content/uploads/sites/14/2019/01/web1_OHIO-Heritage-College-FROM-NE_ne201912513829488.jpgThe new medical education facility to be built in Athens.